I am working on a book and new line of greeting cards and gift line for my website and am offering a sweet discount. I will work hand in paw with you to capture your pet in their "everyday" moments, as seen through YOUR camera lens and MY digital painter's palette. I am only able to created a limited number at this price. ...in turn I am asking permission to feature your companion animals in my book and gift line. 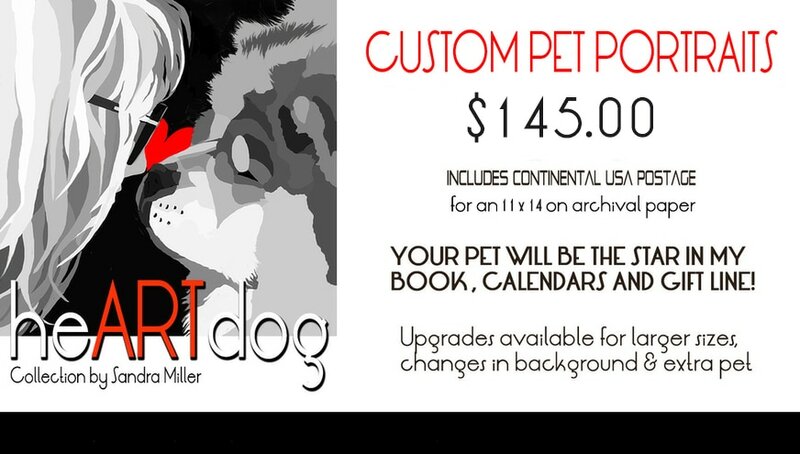 Your purchase includes ONE 11x14 CUSTOM PORTRAIT which I create from your own photograph of a single pet . The finished artwork is hand rendered in my signature soft and dreamy watercolor style , and will be printed and shipped from my professional printer on heavy weight archival quality art paper...ready to mat and frame for your own wall or gift giving . A smaller "FACEBOOK READY" copy like you see above, is also included as a bonus. Artwork copyrights are retained by Sandra Miller and I retain the rights to reproduce the art in the future. * You can upgrade with an extra pet, props, or larger portrait size by adding the options provided above to the base price of the portrait. * You will receive an email "proof" from me and I will do ONE complimentary set of minor tweeks to your portrait before sending to the printer. Your portrait should be completed in 2 weeks and your order will arrive in about 5-7 days once approved and shipped. * For most of my gift line products (SEE BELOW) I will not charge for my design time customizing the product with your portrait. You pay the normal price I charge for each individual product in the store. * The original digital files created to produce this artwork remain in the copyright and the property of Sandra Miller and will not be for sale or released to the buyer. Once your 11x14 CUSTOM PORTRAIT is shipped, I can render your finished artwork on pretty much any product in my store or on a custom pendant or necklace! Just let me know how I can help you and we will work together to create some fun "portrait ware"
​Artwork copyrights are retained by Sandra Miller and I retain the rights to reproduce the art in the future.